Answer: Instances like the one you’re describing are common — many children are injured while at a friend’s or relative’s house; after all, they’re the ones you trust with your kids. However, no one wants to alienate a friend or family member with a lawsuit. Fortunately, it’s likely you won’t have to go to that extreme. Generally, a homeowner’s (or renter’s) insurance policy will cover injuries that occur on a person’s property. You should discuss the accident with the homeowner and talk to him or her about filing a claim. An isolated incident probably would not raise the premium and, if it did, it shouldn’t be by much. Save all the medical documentation you have to bolster your case and to help ensure your settlement reaches the fullest amount possible. Filing through homeowner’s insurance may also mean that any follow-up appointments relating to the initial injury would be covered as well. However, it’s important that you file promptly because many insurance claims require timely action. While your situation is fairly cut-and-dry, other childhood injury liability cases can be more difficult. Safe Kids Worldwide reports that more than 38 million children participate in sports each year in the United States, and 1 in 3 who play team sports are injured seriously enough to miss practice or games. If you have an active, sporty child, the odds are good that he or she will suffer an injury at some point. Usually, injuries are part of the assumed risk of playing sports, and as such, no one can be held liable. However, in some instances this is not the case. If the injury is not “common to the sport” and/or the result of negligence, the supervisor (coaches, instructors, etc.) may be liable for the injury. For example, if a child has a sprained ankle and the coach knows this and still requires him or her to participate, causing further injury, that may be grounds for a negligence liability case. If an injury occurs due to unsportsmanlike behavior, such as one player hitting another player intentionally out of anger, the aggressive player’s parents may be liable (similar to bullying cases). Sometimes, injuries can occur because of an equipment defect, in which case the manufacturer of the equipment may be liable. Bullying is a big topic nationally and the cause of concern for many parents. 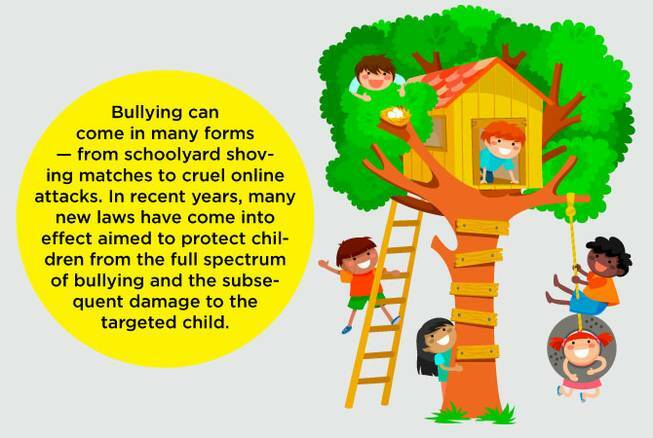 Bullying can come in many forms — from schoolyard shoving matches to cruel online attacks. In recent years, many new laws have come into effect aimed to protect children from the full spectrum of bullying and the subsequent damage to the targeted child. Physical injuries sustained as a result of bullying can often leave the bully’s parents legally responsible for the damages. For example, if a neighborhood bully intentionally pushes another child and causes an injury that requires medical attention, you can sue the other parents for those medical bills, and possibly for pain and suffering. In instances of cyberbullying, such as relentless harassment online, spreading rumors via social media channels, or posting derogatory information about the victim, the bully’s parents may also be liable. However, emotional trauma can be more difficult to prove than a physical injury, so it’s imperative to speak with an attorney about your options. If the bullying occurs at school or online between classmates, the school may be liable in some instances, but only if it did not fulfill its legal responsibility to protect the child. The school needs to have prior knowledge of the bullying, otherwise it’s not liable. If the school had knowledge of a pattern of bullying and did not take action to prevent further abuse, or acted negligently toward the affected child, it can be on the hook for damages. Most schools have strict bullying policies, so if your child is being bullied, it’s important that you go to the school directly to express your concerns and to create an action plan to stop it before the behavior escalates.